2 blue ducks, a distribution, manufacturing and licensing company who teamed up with Disney and the RCMP Foundation to create the stuffed RCMP Mickey and Minnie dolls. Mickey Mouse has joined the Mounties, and Minnie too! Rocking the red serge, RCMP Mickey Mouse makes a great gift for children and collectors alike. Soft and Cuddly those two are sure to bring a smile to your child. Just in time for Canada’s 150th anniversary July 1st, the RCMP Mickey and RCMP Minnie project is a unique blend of globally-recognized cultural icons. 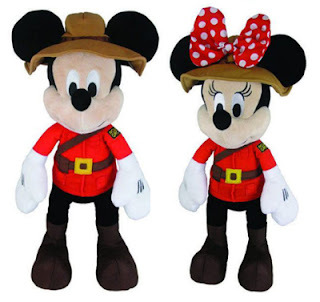 RCMP Mickey and RCMP Minnie can be found in hundreds of toy stores, RCMP detachments, Indigo, Toys “R” Us, the Drake General Store, airport stores and online through the Mountie Shop. Win your very own pair of RCMP Mickey Mouse and RCMP Minnie Mouse valued at $65.00. Enter to win at www.urbanbaby.ca/category/contests. Good Luck!